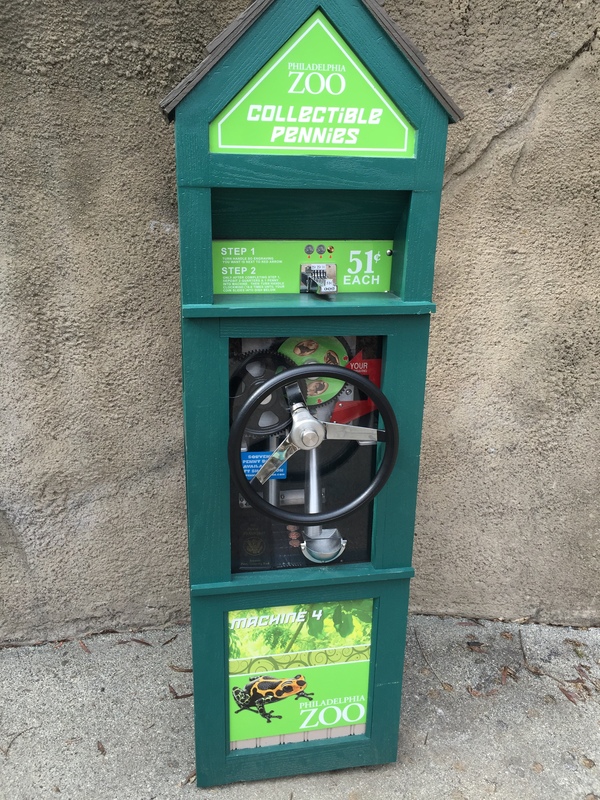 Philadelphia Zoo 2016 – New Machines!! 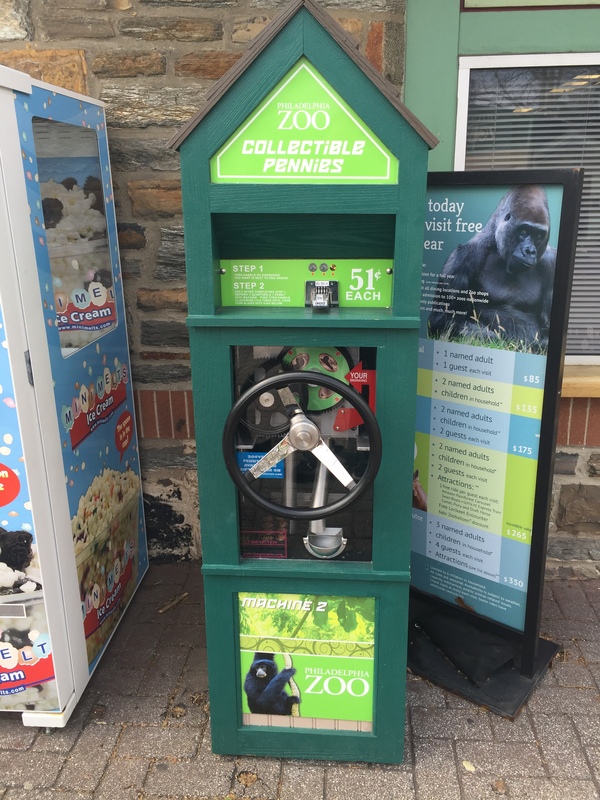 Last year we had decided to support our nearby Philadelphia Zoo by becoming members. 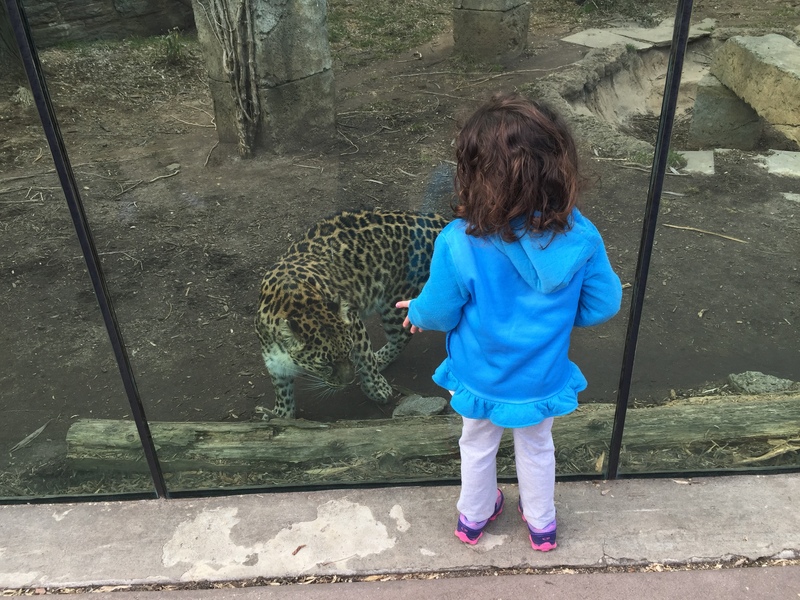 The fee for the family was really quite reasonable and not only could we visit that zoo but we also had free admission to hundreds of zoos and aquariums across the country. We have had some really cold weather recently in Jersey and going outside even just running to the card was more than we could take. Finally this past weekend we had some nice weather and I jumped at the change to take my daughter Hanna out for a trip to see some animals. 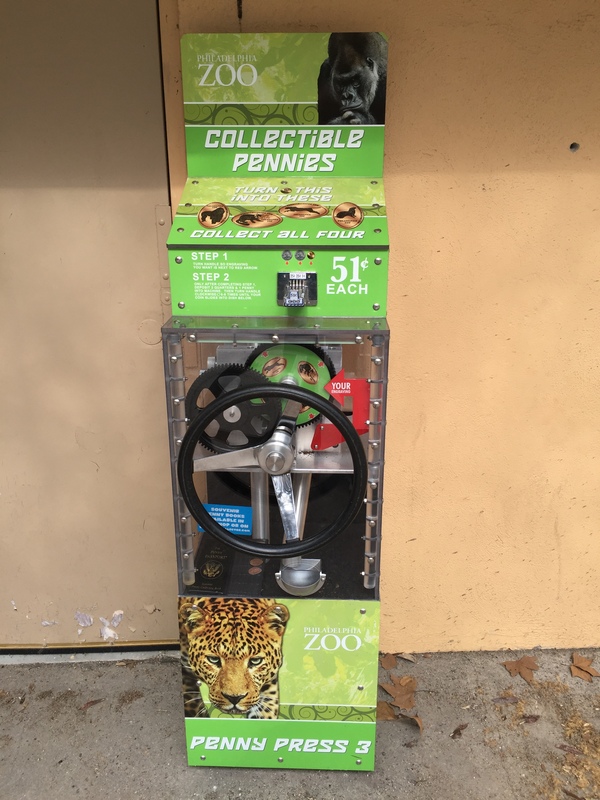 When we visited the zoo in previous years they always had a few penny machines around, and when we went last year they were all gone and I wrote out it here. In that post I said I hoped that this was a sign that new machines were on the way and wouldn’t you know it I was absolutely correct. Plus there was news about a mystery machine that was to be available but no pictures or information were available. This sounded like a challenge. After a 40 minute trip we arrived at the zoo and headed inside. We didn’t make it far before running into the first new machine. Right beside the admission ticket booth was a brand spanking new machine. I will say I’m not a huge fan of the wheel instead of the handle crank, but that didn’t stop me from pressing a set. The first set of designs included a Flamingo, Monkey, Lion and the 6ABC Zoo Balloon. 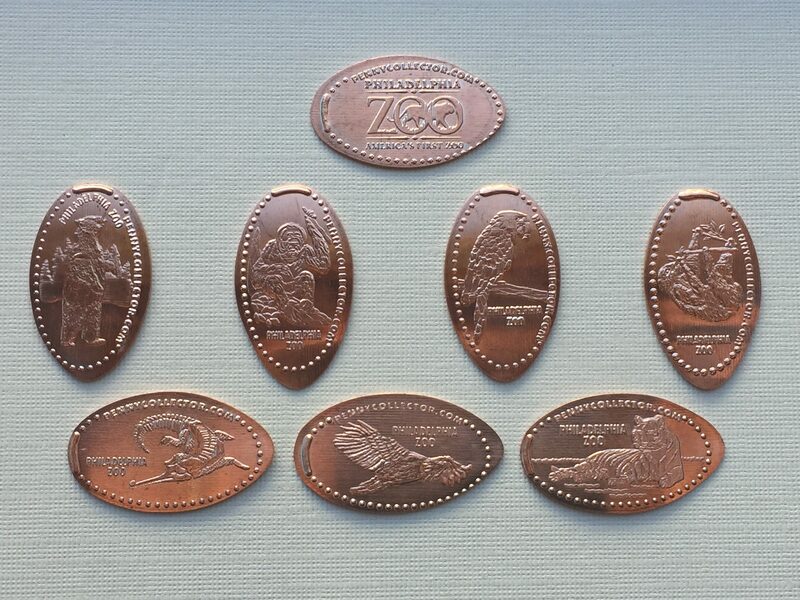 All of the designs also said Philadelphia Zoo. Thankfully with our membership we didn’t have to wait in line for any tickets and just headed through the gate. Making our way methodically around every inch of the zoo we eventually came to big cat country which Hanna always likes. Apparently this Leopard was fond of Hanna as she kept following her as we walked past her. 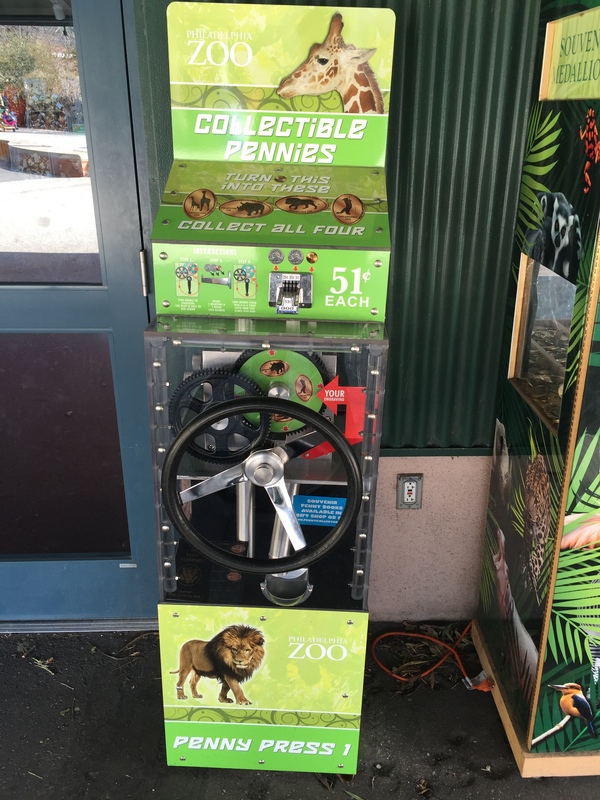 After exiting the big cat area we were facing the Trading Post Gift Shop which was the location of the next machine. Hanna helped collect the pennies as I pressed them. She always likes to show them off to other kids that may be nearby. 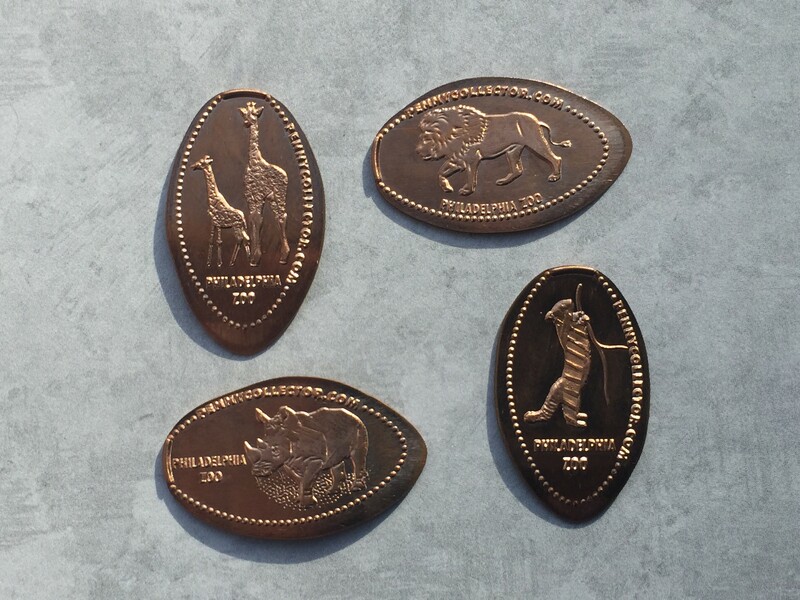 These next four designs included two Giraffes, a Rhino, another Lion, and a Lemur. By this time Hanna was hungry so we stopped for some lunch. A couple of the kids Hanna had shown off our pennies to came up with their parents and asked if we knew of any other machines. I told them we were on the lookout as well but had some tips on where they could be found. The family was very appreciative and headed off on their search. Once we were done eating we headed back out and it didn’t take long before we found the third machine. The machine was right outside the Grove Gift Shop which was closed for the season. Thankfully they kept the machine outside so we could use it. Continuing the theme of the zoo these next four designs had another set of animals on them. A Cheetah, Gorilla, Seal and a red Panda. 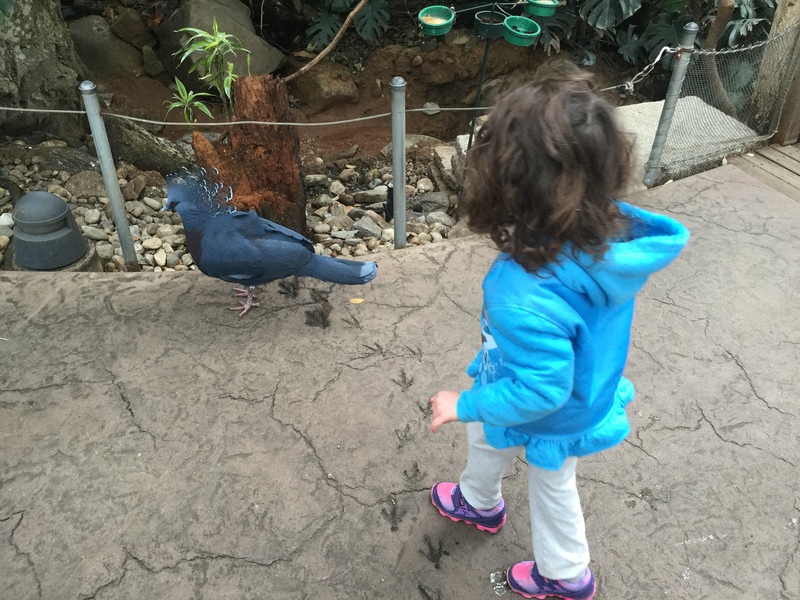 Next we headed into the bird sanctuary which I liked but Hanna wasn’t a big fan of the birds walking and flying all around here. Leaving before any of the birds could escape with us we headed down the last stretch of the zoo. Here we found the Giraffes, Rhinos and Zebras. Across from them was the Polar Bear Observation area which has an above water view and a below water view. On the lower viewing area we found another machine. The family we had met back at lunch was just leaving this machine and waved as they left. We made our way up to the machine and pressed out set. As you can see in the above picture the images were of a Frog, Peacock, a Kangaroo and what I believe is an Aye-aye Lemur. 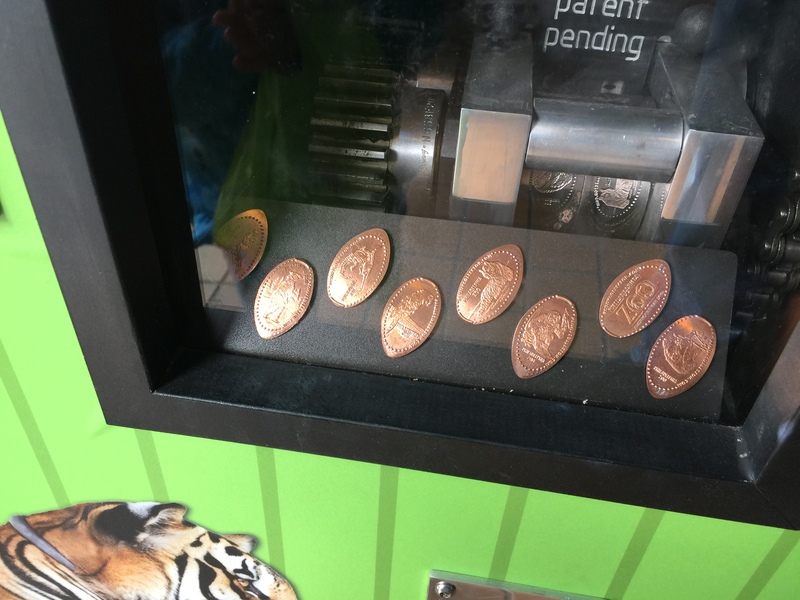 These above four machines were the ones that I knew about from pennycollector.com but we still had to find the mystery machine. I did have some doubt that it may not have been made available yet, but I was holding out hope we would find it. There were a few areas we had only briefly checked out and now we headed back in for a more thorough search but we didn’t find it. 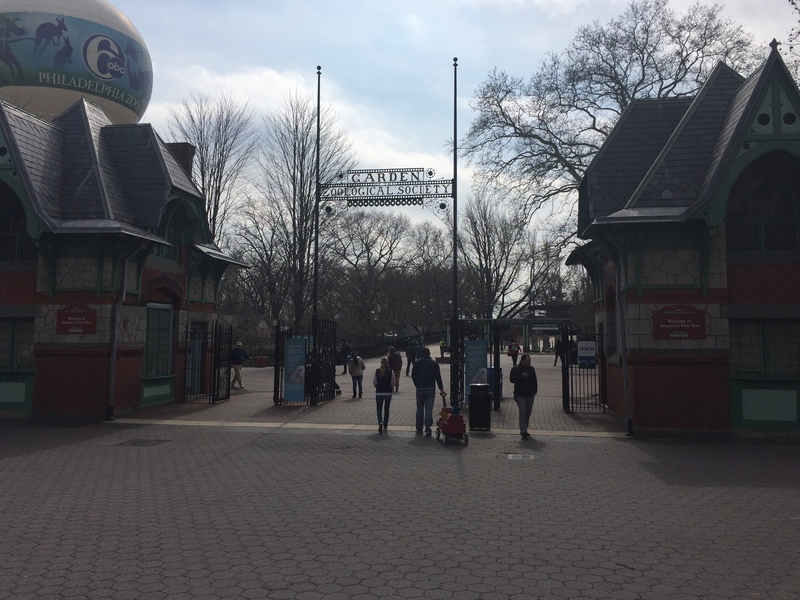 As we started to head towards the exit I had one last glimmer of home the ZooShop. Hanna ran in to try to find a toy to bring home and after she carefully selected a stuffed Pink Baby Elephant we headed out the middle set of doors and found the last machine. As an extra special surprise this was another one of the latest and greatest super-multi design machines. It had 8 brand spanking new designs available in total. 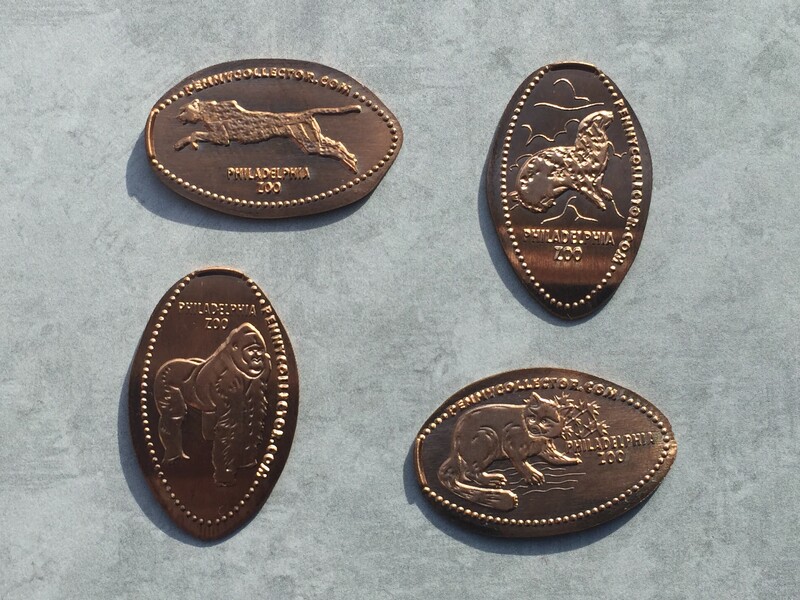 Above is a close up of the 8 designs available that are displayed in the machine. 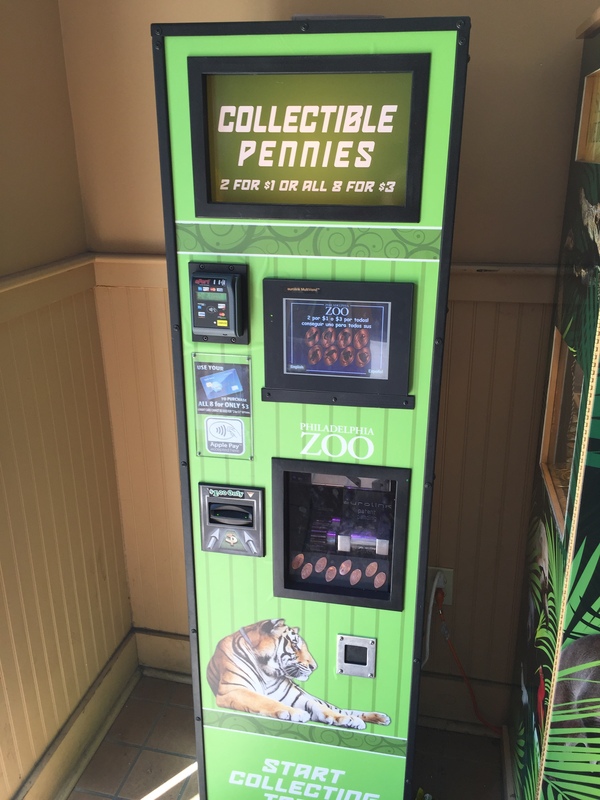 The cost for this machine was 2 designs for $1 or all 8 for $3. 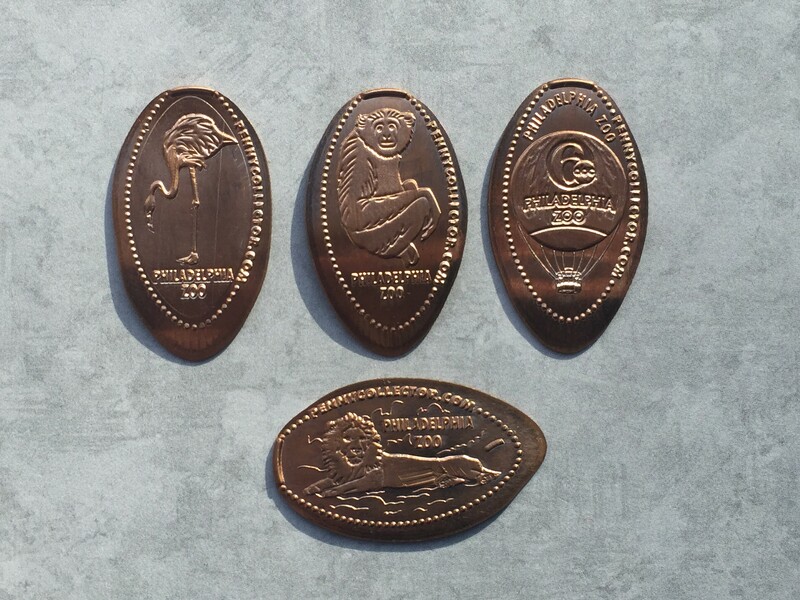 All the designs are pressed on blanks which give a nice shiny finished product. 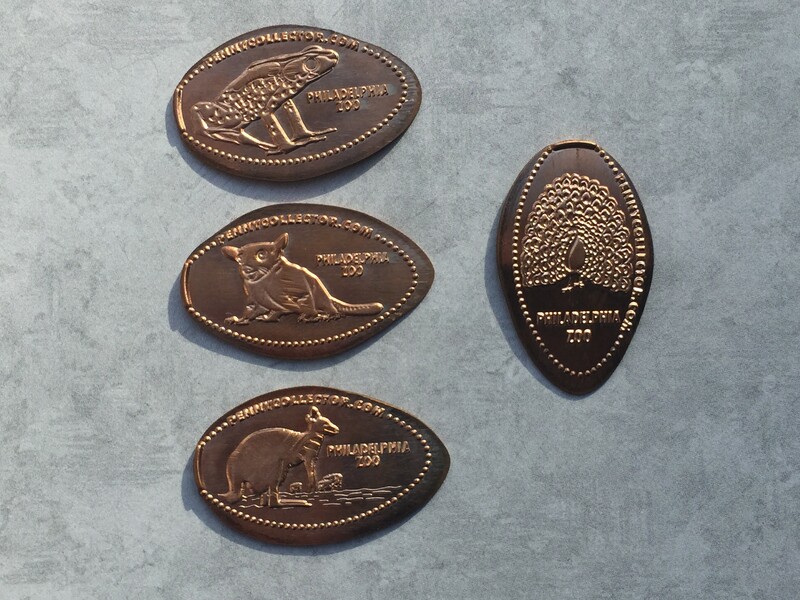 The designs included: The Zoo Logo, a Black Bear, and orangutan, a Parrot, a Three-toed Sloth, a Crocodile, a Northern Bald Eagle, and a Amur Tiger. We were happy with our visit and had a pocket full of new pennies to add to our collection. Another great use of our annual pass which really turned out to be a great investment for our family. Looks like I’ll be renewing it very soon so I can keep an eye on these new machines.